LAPD cites safety violator at Metro Blue Line crossing. Photo by Juan Ocampo. 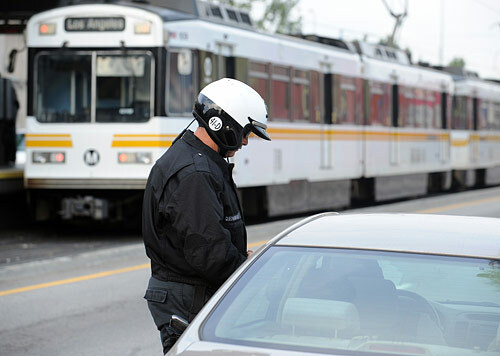 In an effort to promote public safety awareness along the Metro Blue Line, the Los Angeles Sheriff’s Department and Los Angeles Police Department today issued 330 citations, 30 warnings and impounded 24 vehicles for 30 days along the street running (non-gated) segment of the light rail line between Washington Station and 7th/Metro Center in downtown Los Angeles. The operation took place from 7 a.m. to 11 a.m. and included 31 motorized officers. Metro’s Corporate Safety staff also was an active participant. The focus was on violators running red lights, making illegal left turns and pedestrian jaywalking. While there has been a steady decline in train versus vehicle accidents on the Metro Blue Line, the level of pedestrian accidents has not dropped. Metro has an active program of “Education, Engineering and Enforcement” to reduce incidents. Illegal left turns and running red lights are the primary cause of train-vehicle accidents with the Metro Blue Line in the non-gated segments while pedestrians illegally crossing the tracks against active warning signs that include flashing lights, bells and lowering gate arms are the top cause of pedestrian accidents in the gated segment of the Metro Blue Line alignment.